Richard W. Taylor and his associate, Michael P. Nordman, were born in Volusia County and both families have been in Volusia County for over three generations. Mr. Taylor's private practice began in DeLand when he joined his father, Sidney H. Taylor in 1977. In 1981, Mr. Taylor was joined by Charles Law Early, Jr. who left the firm in 2000 to become a commercial airline pilot. Mr. Taylor was joined by Michael Nordman in 2003. Richard W. Taylor received his BA degree from Florida State University in 1970 and his JD degree, with honors, from Florida State University in 1973. He then began a four years period of active duty with the United States Marine Corps, where he attended Naval Justice School in Newport, Rhode Island and Military Judge School at Charlottesville, Virginia. He served as the commanding officer of Company A, 1st Battalion, 7th Marines, 1st Marine Division. In 1977, after his tour of active duty, he returned to DeLand and began practicing with his Father. "Legal Descriptions, Survey Law, and Easements" presented at the Real Property Certification Review Course conducted by the Florida Bar in the years 1994, 1997, 1998, 1999, 2000, 2001, 2002, 2003 and 2004. "Overview of Easements", presented at the "You Can't Get There from Here" Surveyors and Lawyers Road Law Seminar conducted by the Florida Bar on October 26, 2001. "Title Problems Revealed by Survey" presented at the 1997 Attorneys Title Insurance Fund Assembly. "Survey Liability for the Surveyor, Attorney, Realtor and Title Insurer" and "Avoidance and Resolution of Liability Arising from Survey" presented at the 1998 Survey Liability Seminar. "Trial of a Boundary Dispute" presented at the 1994 Boundary Litigation Seminar Conducted by the Survey Law Committee of the Real Property Probate and Trust Law Section of the Florida Bar. "Surveys, Encroachments and What to Do about Them" presented at the 2001 FLEA Real Estate Team Seminar. He has been called as an expert witness on various property issues and frequently is consulted by other counsel engaged in Real Property and Probate Litigation. 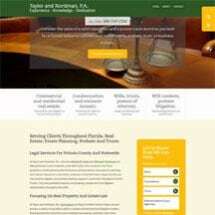 Mr. Taylor has handled numerous complex transactional and contractual matters. He believes his experience in litigation, makes him far more adept at drafting contracts and handling transactions. He strongly believes that private property rights are the essence of freedom and should be preserved and protected by zealous representation. He has fern and citrus interests and is Chairman of the Board of Surety Bank in DeLand. Mr. Nordman left college for a business opportunity, and after ten years experience in the business world, he returned and completed his B.B.A. in Accountancy at John B. Stetson University. He graduated with honors from the University of Florida College of Law in Gainesville, Florida completing his law degree in only 2 ½ years. His real world business experience and academic achievement, have prepared him to handle complex transactional and litigation matter. The firm provides a casual, comfortable, and friendly environment for its clients. It is with pride that both counsel note the stability of their client base and that many of their clients have been lifelong clients.